Feet Up &amp; Fed Up! Feet Up & Fed Up! Brace yourself for a moaning post. I'm a bit that way out today. Highlights: Cankles, Demanding Kids, and Sleep Deprivation. I have not been able to sleep the last few nights. A combination of being way too hot, and way too big is making getting comfortable pretty much impossible. I'm going to bed at a sensible time and sleep until about 1ish. Then I'm tossing and turning until up to 3.30 before I finally conk out again, only to be woken by the kids at any time from 5.30 onwards. So you can imagine I'm not feeling my best. I've tried to nap in the day but as I'm generally either at work or I have the kids it's not very do-able. And when I do manage to nap, I sleep even worse at night. My feet and legs are the main cause of my unhappiness at the moment though. 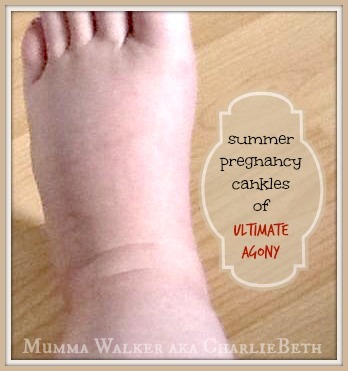 I'm used to swelling up in the last few weeks of my pregnancy, but I've never suffered like this before. Then again, I've never had a summer baby before. My feet, ankles and calves are MASSIVE! I try all sorts to reduce to the swelling, and I can get it down for periods, but it keeps coming back. I'm drinking plenty of water, I soak my feet in Epsom salts in the evening, I keep them elevated above my heart when I can... but again, I have a job and a family to tend to so I struggle to enough of anything to keep the swelling down all the time. There are still at least 3 weeks to go. It's only a week and a half until the kids finish school and nursery. Frankly, I am dreading the time between now and the baby coming because I am already exhausted and short tempered. I can't see myself feeling any better any time soon. I live for the few hours a week when I'm home alone or with just one of the kids - which is nice and quiet and easy. The thought of all 3 of my little darlings 24/7 while sleep deprived, hormonal, and hurting from the swelling in my legs and feet.... It is not soothing. I keep smiling in public! I try not to whine too much. My poor Hubby is very much aware of how much I am suffering, and I can only sing his praises for not only putting up with my self pity but also stepping up to sort out the kids and the housework. But I can see the strain is taking it's toll on him too. This time next month.... Baby Bean should be here! - We keep telling our selves this. I'm always much better once the baby has arrived and I am feeling more mobile! I am starting to wash some of the 0-3 month baby clothes today though, which is making me a little happier! I should be able to start marking off the last few jobs on my Before Baby list in the next few days.